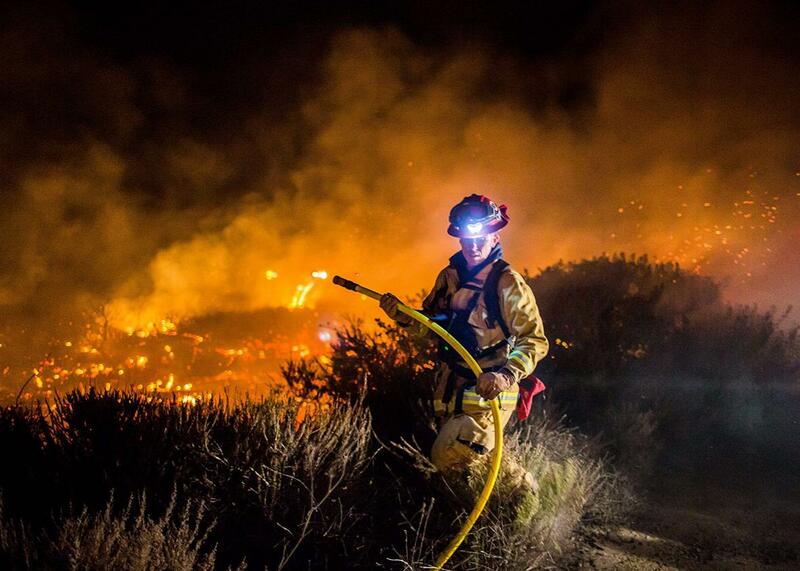 California wildfire photos show Los Angeles hit hard by fires raging the area. The images are like something from an apocalyptic film. Firefighters work to extinguish the Thomas Fire as it burns past the 101 toward the Pacific Coast Highway in Ventura, California, on Thursday. The images and accounts of the fires ravaging the greater Los Angeles area look like still frames from an apocalyptic film: cars on a highway to hell, charred skeletons of houses, red-tinged skies. You’ve likely seen the images of freeway exit signs backgrounded by blazes or heard Fox News chairman Rupert Murdoch’s Bel-Air vineyard estate was being singed. “These are days that break your heart,” said Los Angeles Mayor Eric Garcetti to the Los Angeles Times. But beyond this horror reel of images, here’s an update on the extent of the numerous brush fires, which, propelled by the strong Santa Ana winds, have torched more than 116,300 acres. The largest and longest-lasting fire threatening the palm-treed landscape around Los Angeles is the Thomas Fire, which began Monday evening in Ventura County, more than 60 miles northwest of the city. According to the California Department of Forestry and Fire Protection, as of Thursday morning, the fire has burned 96,000 acres (that’s 150 square miles, or close to three times the size of the largest of the devastating Napa Valley fires this October), but it’s only 5 percent contained. Los Angeles is on fire-these images are nuts. Everyone stay safe! The Skirball Fire was Wednesday’s most dramatic headline fodder: It broke out early that morning in the wealthy Bel-Air neighborhood of Los Angeles, near UCLA and the famous Getty Museum. It temporarily shut down the 405 freeway, the busiest interstate in the county, during peak morning commute hours. It also prompted UCLA officials to cancel classes for half of Wednesday and all of Thursday. As of Thursday morning, it spanned 475 acres and was only 5 percent contained. Further north in the Angeles National Forest, the Creek Fire burned 12,605 acres and was 10 percent contained as of Thursday morning. Since its start in the predawn hours Tuesday, it had destroyed 15 structures. California State University, Northridge, canceled classes. While there have been no confirmed human casualties, nearly 30 horses died in the fire, according to the Los Angeles Times. The last uncontained wildfire covers a 7,000-acre swath of the northern suburb of Santa Clarita. The Rye Fire, which began Tuesday morning, had caused 1,300 homes to evacuate by Wednesday afternoon but had destroyed only one structure and was 15 percent contained by Thursday morning. Other fires, like a 260-acre fire in San Bernardino or a blaze that popped up in Malibu on Thursday morning, have been fully contained as of publication time. What prompted the series of quick-moving wildfires? The brush burning index, a way for the fire department to tabulate risk based on moisture readings, dead vegetation fuel, meteorologist forecasts that factor in humidity and wind, and historical data, is considered to be “extreme” if it’s above 162. But the brush burning index for this Wednesday into Thursday was a whopping 296, the highest the fire chief said he’s ever seen, according to NBC Los Angeles. The notorious Santa Ana winds this year are especially vicious; CNN reports that the previous time the winds resulted in multiple days of red flags and warnings was a decade ago. Fortunately, on Thursday, the winds did not reach the fire-whipping speeds that forecasters had feared.